Although our teeth can be very strong, there's always a chance a tooth can chip, crack or break. These fractures and breaks can happen when biting down on something hard, falling, being hit in the mouth and untreated cavities. A broken tooth doesn't always hurt and sometimes small fractures can occur without someone knowing it. However, broken and cracked teeth are usually accompanied by discomfort and if the nerve inside the tooth is damaged it can very uncomfortable to drink or eat hot or cold foods. 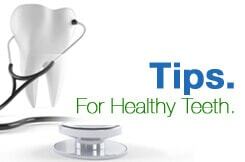 Unfortunately there is not much you can do on your own to treat chipped and broken teeth. If there is an accident involved, such as a car crash or even bumping into someone and falling on a sidewalk, chances are an EMT will tend to you and instruct you to visit an emergency room for treatment. If the crack or break occurs from biting down on something hard and you are by yourself then there are some steps you can take to alleviate the pain until you get to your dentist's office. If the cause of the break is an accident, fist fight or being struck with an object you may need to visit the emergency room. If your dentist is closed then the hospital is your next stop. Don't wait to treat a broken or chipped tooth, treat it as soon as you can and seek our professional help.